I’ve been making my own dish tabs for years, but recently I tried a new recipe that is sooo much easier to make than the one I’ve been using. 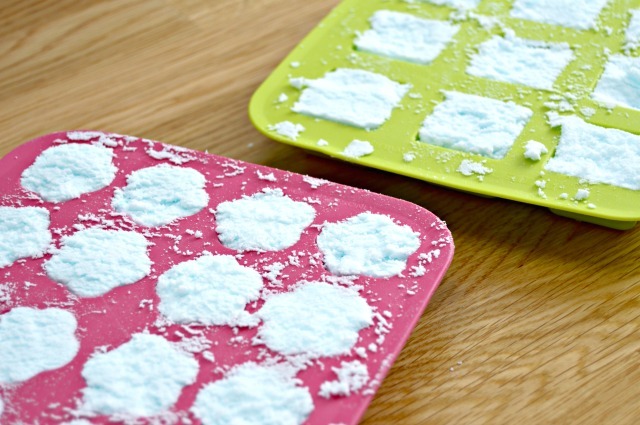 You only need 3 ingredients to make these homemade dish tablets. They will leave your dishes clean and sparkly and will help save you time and money! I made a quick video showing how easy they are to make in real time…check it out below! You can click the links to find the products listed below…these are affiliate links that I may receive a commission for if you buy. 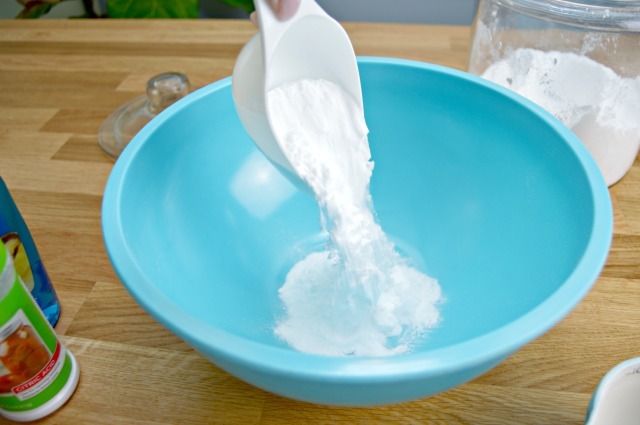 Start by adding one cup of baking soda to a large bowl. Add 1/4 cup of citric acid. 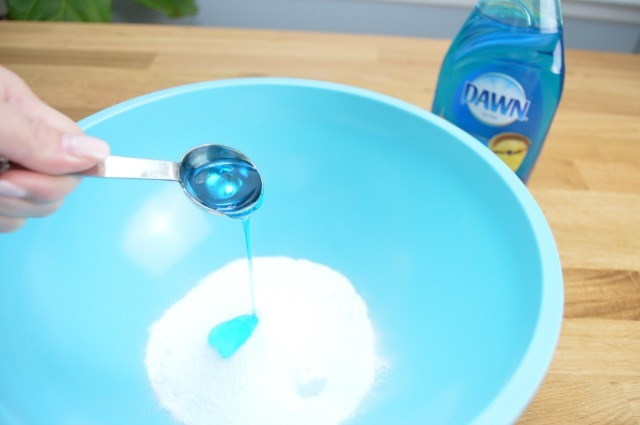 Add 1 tablespoon of dish liquid. 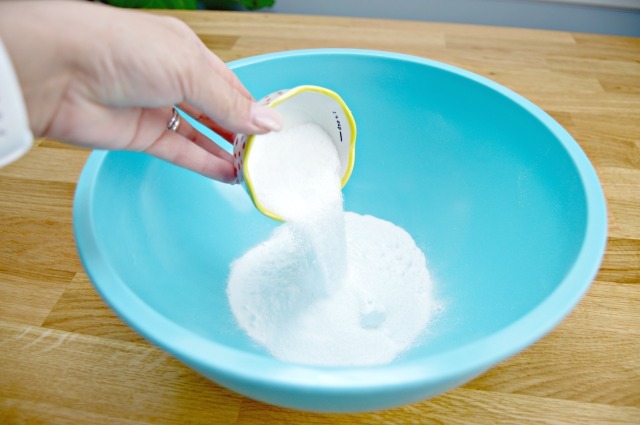 Mix well using a whisk or you can use your hands like I do…I just think it is easier to mix it well this way. 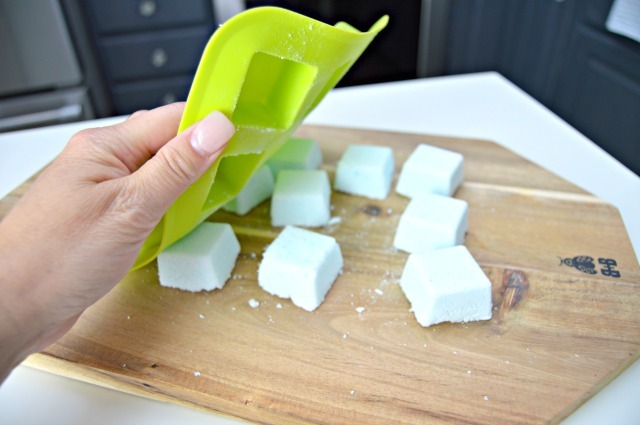 Push the mixture into silicone ice cube molds. I used two different molds so I could use all of my mixture. Wait about 10 minutes and level them off with your hand. They expand just a little bit, but much less than the old ones I used to make. Once you level them off, they shouldn’t expand much more. Let sit for at least 4 hours or overnight. They will harden like store bought dish tablets. Now just flip your molds over and push the tabs out. They are ready to use! Use one tablet per load of dishes. Just place directly in your dishwasher and run a normal washing cycle. Store them in an airtight container and keep them dry until time to use them. Happy cleaning! 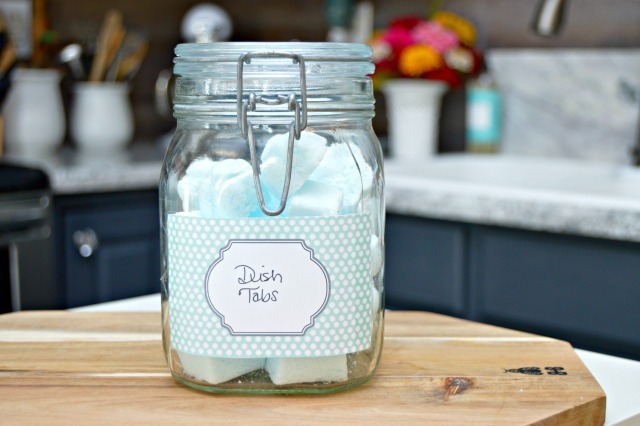 Want to add a little cuteness to your homemade cleaning solutions? Grab my Free Printable Cleaning Labels HERE! 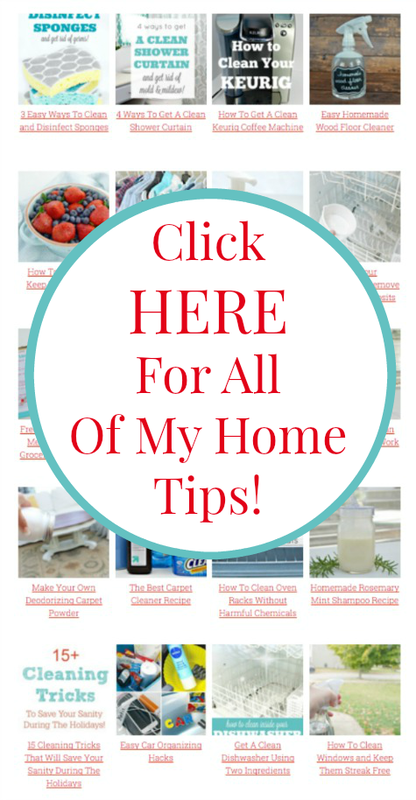 Looking for more home tips and cleaning recipes? Find hundreds of them HERE on my Home Tips Page! Where can I buy the Citric Acid???? They are easily available at any Indian grocery store, if you have any nearby. They are cheaper than somewhere else. Can YOU just add aa tablespoon instead of using molds? I had the same question. I’ve seen other recipes almost identical that leave in powder form. Given that and therefore assuming it’s okay, the follow up question I had was how much powder per load. And your suggestion of 1 tablespoon seems to be about spot on, as in a separate comment Jessica said that this recipe makes about 20-24 tablets, and there is 1.25 cups of dry ingredients, so 1.25 cups / 20 tablets = 1 tablespoon. Hope that is helpful if anyone else is looking for this answer! No. An acid is needed for the baking soda to be activated & work. Check with local health food stores. It would be found with seed sprouting supplies. Can i use vinegar instead of citric acid? Vinegar in its liquid state will immediatly catylize the reaction, generating carbon dioxide. You want that reaction to happen IN the dishwasher, as it helps clean your dishes. Vinegar is just watered down acetic acid, so you could distill a dry crystalline solid acetic acid from vinegar and use that, or just buy anhydrous(dry) acetic acid. I have used the inside of apple cider vinegar capsules with luck as a replacement for the citric acid! And the bottle was super cheap. Only downside is having to break open the capsules. Walmart has it, some grocery and hardware stores. I ordered mine on ebay and amazon. I don’t know when you asked your question, but it can be purchased on Amazon. I couldn’t find any at my local store, so I just ordered online (Amazon). What do you mean “place them directly in the dishwasher”? My dishwasher has a two-part soap dispenser with a covering lid where I place tablets? Place there, or just “toss” in the dishwasher before starting? Some of the molds that I have used don’t fit in the dispenser. If it fits, you can add it there, if not, just toss it in before you start your dishwasher! How big of a tab do you use per load? I have a few molds and they are all different sizes. Hi, Tracy! Mine are about the same size as an ice cube. Hope this helps! That’s the greatest thing about these tablets…no film since they don’t contain too many ingredients! Hi there! I made these per the recipe & I am actually getting a film. We have REALLY hard water & no way to soften it. Is there a coordinating rinse aid you can make & use? Or is there something else I can do? Maybe add a little more acid or dawn? Hi, Becky! Try adding vinegar or store bought rinse aid to your dishwasher. There should be a compartment that you can fill. It should help with hard water spots! Do you think regular plastic ice trays will work? 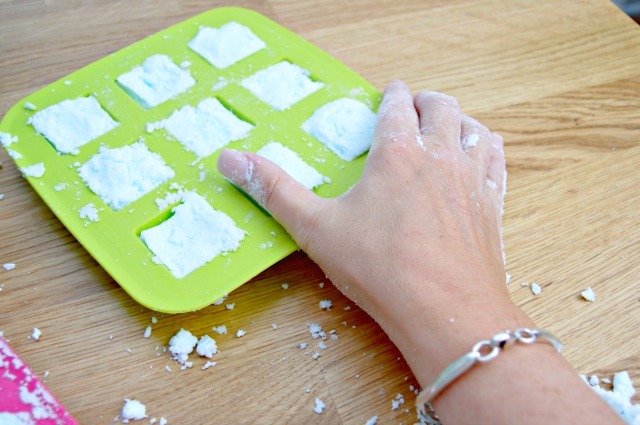 Absolutely…regular plastic ice trays will work perfectly! Thanks for asking! Can you explain what the citric acid does for the dishes? I’ve never made these so I’m curious what an ingredient used in canning would contribute to the cleaning process. Thanks! Citric acid is used to remove lime particles and help with hard water. Hope this helps! You are using about 3/4 cup in the recipe, so any size jar will do. Hope this helps! How many tablets come out of one batch? Hi, Latasha! It depends on the size of your tray. I usually get 20-24 tablets out of each batch. Hope this helps! Are you to use 1/4 cup of citric acid or 3/4 cup? 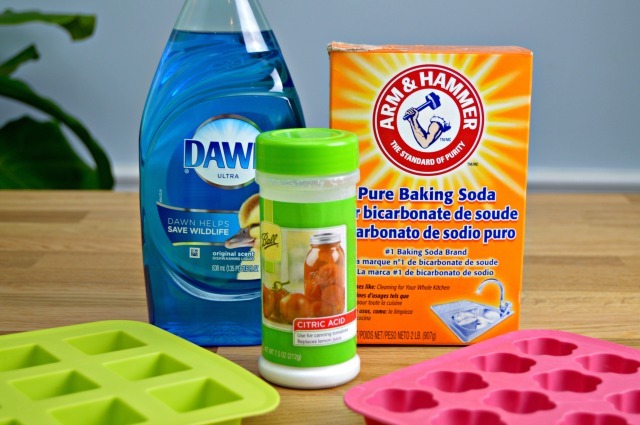 Can you use castile soap for the dish soap? How many batches can I get out of the bottle of citric acid? Hi, Suzanne! At least 2-3 batches from the small container of citric acid that I showed. Do these really work as well as regular tabs? I tried making them and they didn’t harden. Very soft and crumbly. Help, what did I do wrong? I had the same issue but managed to fix it the second time (I think, I’m still waiting for it to dry) In the second time I added only two teaspoons but one at a time. I added one tsp, mixed it in, then added the second and mixed that in. That gave me a much more stable mixture that seems to have worked like the instructions say it should. do you need finish to reduce spotting? or do you jot have a problem with it when using this? HOW MUCH VINEGAR FOR THE RINSE AID? Just fill the place where you would put a rinse aid, with vinegar. My tablets won’t stop expanding. I’m I doing something wrong? I am wondering if u think substituting Castille soap would work in its place? For me….that would satisfy my need to use products that are pure. I would like to know how to get the baked on stains off the upper part of my microwave? Hi, Diane! 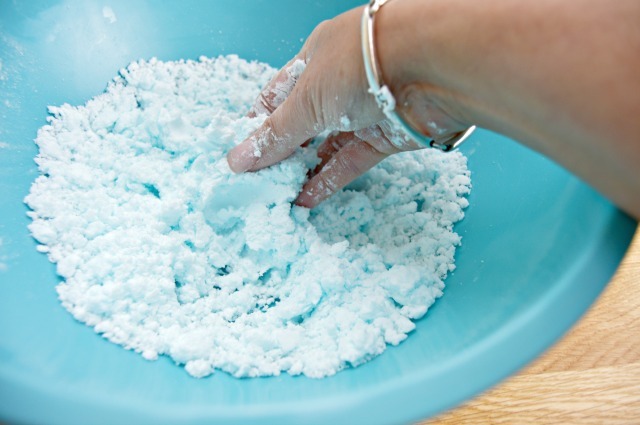 Try making a paste using baking soda and water to use to scrub it off. Pour a little bit of vinegar in a cup and microwave it until it boils. Turn off the microwave and leave the door closed for 3-5 minutes, so the acidic steam can work to loosen the gunk on the inside of your microwave. Open and wipe clean. No scrubbing. I do this all the time for my microwave. If the gunk been sitting for a while, I will let the vinegar sit for at least an hour after warming before wiping the microwave clean. This does wonders. If I don’t have citric acid can I replace it with something else? Hi, Chellsea…the citric acid is really needed for these. They help to harden the tablets and also help get the dishes sparkling clean. Hope this helps! Could you use lemon juice instead of the citric acid? They should keep for up to 6 months. I make a large batch and store them in an airtight container and keep them under my sink. Hope this helps! I have the same problem as Michelle- but notice no replies for her or the other one that had a problem with them not hardening. Posting those replies are helpful for others as well. Thank you!! Hi there… I’m just wondering, the inside of my dishwasher is stainless steel, are the dishwasher tabs safe to use? Should work just fine…all of the ingredients are safe for stainless steel! Where can I buy your jars and other containers and ive trays? Hello! I was looking to see what dawn soap had in it and noticed the dawn soap label specifically says not intended for dishwasher use. Would you recommend any other soap to use as replacement? Hi, Lindy! They are really referring to the fact that you aren’t supposed to use a great deal of it in the dishwasher. There isn’t enough used in each of these to affect it. The only reason you shouldn’t use much is because of the sudsing. No worries with these! Will the acid and dish soap break down the plastics and rubber inside the dishwasher over time? These sound awesome and I have all the ingredients. I’m just concerned about the long term effects. How long have you been using them? I do not have a dishwasher!! Can I use the Dish Tablets in a sink full of hot water! I love the idea of them. O.k thanks. I am going to try them. I have a white kitchen sink and it may just help with keeping that cleaner also. Hi Jessica! Just giving your recipe for these tabs a try, I’ve tried another type but they left a film on a lot of my dishes & left some very spotty. I was wondering if I can swap the baking soda for washing soda? I feel like with our kind of water the baking soda my have been what left a film. What do you think? Thanks! These tabs work so well. I also added a few drops of lavender, lemon and orange essential oils to recipe . They smell so good and leave my dishes clean. I used a regular ice cube tray to mold. They are slightly larger than the brand I usually purchase but I haven’t had any issues with leftover residue . Will definitely make more of these instead of purchasing tablets. These work amazingly well! I was literally taken back by how much cleaner my dishes and dishwasher were than with the store bought stuff! Unfortunately my tree nut allergic son had an allergic reaction around the time I mixed these and I realized later that the citric acid had a tree nut cross contamination warning. I’ve been unable to find citric acid that is tree nut free. Does anyone know of any? Holy moly I’ve been reading all these comments and I would just like to say that you are a real trooper with all the replying and advice! I love these tablets, just came back for the recipe again to make a new batch. Thank you! I made these for the first time a few weeks ago. When I put the mixture into my ice cube trays, it kept expanding longer than 10 minutes. So much was coming out, that I had to repack the ice trays. Once they finally stopped expanding, I let it be for several hours. When I tried to take them out of the ice trays, just about ALL of them crumbled into a giant mess. I did one batch with blue Dawn and one batch with the Meyer’s Lemon Grass soap. They both came out like this. What could I have done wrong? I should mention that I made these for my toilet. I do plan on also making them for my dishwasher once I run out of the store bought detergent. I have just made this recipe twice but it turns to a fuzzy liquid, does it set over a period of hours? Your pictures dont look liquid like mine do. The three ingredients for the toilet bombs and dishwashing tablets seem to be the same, is that right? I just made these tonight, I have to let them sit overnight but so far I’m optimistic! They’ve been sitting for about 30 minutes. The consistencylooks similar to your photos, although they aren’t rising like you mentioned. I hope that won’t affect how well they work. Just made these and they keep expanding no matter how often I scrape the overflow…….what gives????? I love this recipe but I also find it hard with the expanding. So, I changed the way its molded. I mix all the ingredients and leave them in the bowl to expand. I wait until it not expanding much anymore, then I take a tablespoon measuring spoon, put some mixture in it and pack it down real hard and then tap it out. It makes a tab that’s round on one side and flat on the other and then I let the tabs sit out in the air until they dry and harden and then I put them in an airtight container. Thank you for what you do. I love thieves all purpose cleaner. Any suggestions on how I can incorporate it into the dishwasher tabs? Do you just keep the rest in an airtight container when you do this? Does the mixture get too hard to use if you didn’t mold them? Also, do you use a tablespoon per load of dishes or? Thanks! I halved this recipe added some orange essential oil drops and put it in my stinky washing machine. No more stinky machine and no more aour laundry! Never buy cleaner pcks again. This sounds awesome! I would really like to make them, but my husband said he is worried about the drain getting clogged and likes the ones we buy because he thinks they’ve put research into it to make sure it doesn’t do that. I know that this is almost the same thing as what they make just without all the chemicals. You can even see on top of the tabs that there’s dishsoap in them, but how can I convince him? Is there an article you can point me to? I’ve tried googling it already and no one seems to know what I want. I just made a another batch of your toilet bombs. I didn’t realize this was the same recipe. They work so great can’t wait to try them in the dishwasher. Thank you. I have made these a couple of times now and can not get them to harden. I have also watched the video several times. Are you loosely packing them in the trays? I love how they clean. I have just been scooping the cleaner into my dishwasher but I really want this to come out correctly and cannot figure out what I am doing wrong. What are your thoughts? Hi, Tammy! Sorry you are having so much trouble. It may just be that you live in a different climate and they need less liquid. I put mine in while wet, and then dry them overnight. They should definitely come out hardened. Try less liquid and see if that helps! I always add a splash of vinegar in my dishwasher. So how will this affect the recipe? Are these okay to use in energy efficient dishwasher models? Hi, I followed the reciepe, mine expanded loads (might have put too much mixture into the ice cube trays) could this be th reason why they crumbled when I took them out of the tray? I made these exactly to the recipe, but they crumbled… why might that be? I’m now just left with the mix again. Trying to make them to add to my eco hampers I’m making for Christmas presents. Thank you! You may want to take your mixture and add a little more vinegar to it. In some climates, if the air is really dry, you may need to add a little more moisture. Hope this helps! My tabs expanded as I made them. I’m wondering if the dish detergent had vinegar in it. I don’t think they should that. Hi. 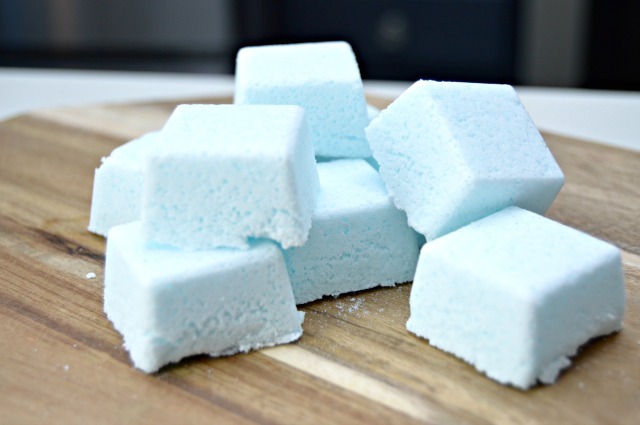 Just tried to make these I’m in UK so used bicarb, Citric acid and washing up liquid and ended up with a massive foam mess, where did I go wrong? Has anyone seen any negative effects on their dishwasher (gumming up the dispenser, corrosion, etc.)? I have a brand-new dishwasher with a stainless steel tub, and would really hate to damage it! Would castile soap work instead of dish soap? I make dish soap with a mix of water and castile soap anyway, so could I use that or straight castile? If so, which would you recommend?